Few luxury holiday lodge properties have the bespoke, sumptuous feel that the Lookout Lodge encapsulates. 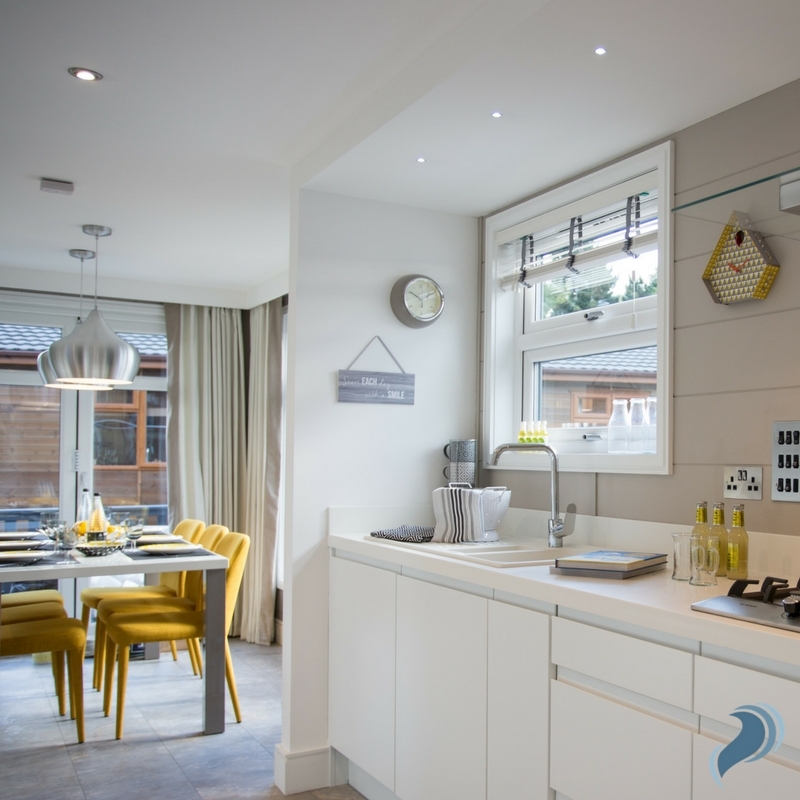 With the beautiful, unique living space feeding through towards a stunning kitchen diner and a variety of luxurious bedrooms and bathrooms, the Lookout holiday lodge is unequivocal in both style and charm. But to really get into the beating heart of this holiday home requires further exploration, so stay with us as we whisk you away on a journey through this property’s elegant, chic nature. Multi-level rooms are the Lookout’s solution to modern living. Venture up a small flight of stairs and you’ll find yourself in the heart of the lodge; the stunning living space. With full-length windows allowing for a gentle light fill every corner, the Lookout living room is soaked in natural light, where you can’t help but feel optimistic. 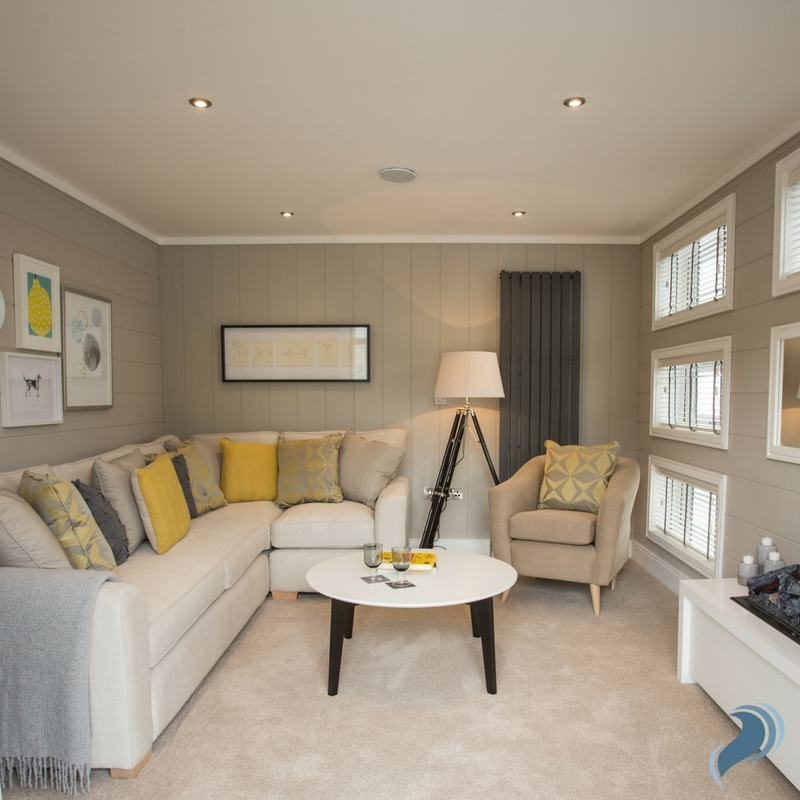 The corner sofa and wall to wall radiator contribute to what this living room does best – offering a cosy atmosphere – and the delicate cream tones with accents of mustard and dark grey provide a contemporary edge into the room that really catches the eye. Spend winter evenings nestled amongst the pillows, and during the warmer months while away the days relaxing on the lodge’s bespoke sofa with the terrace doors thrown open, a cool breeze enveloping you. 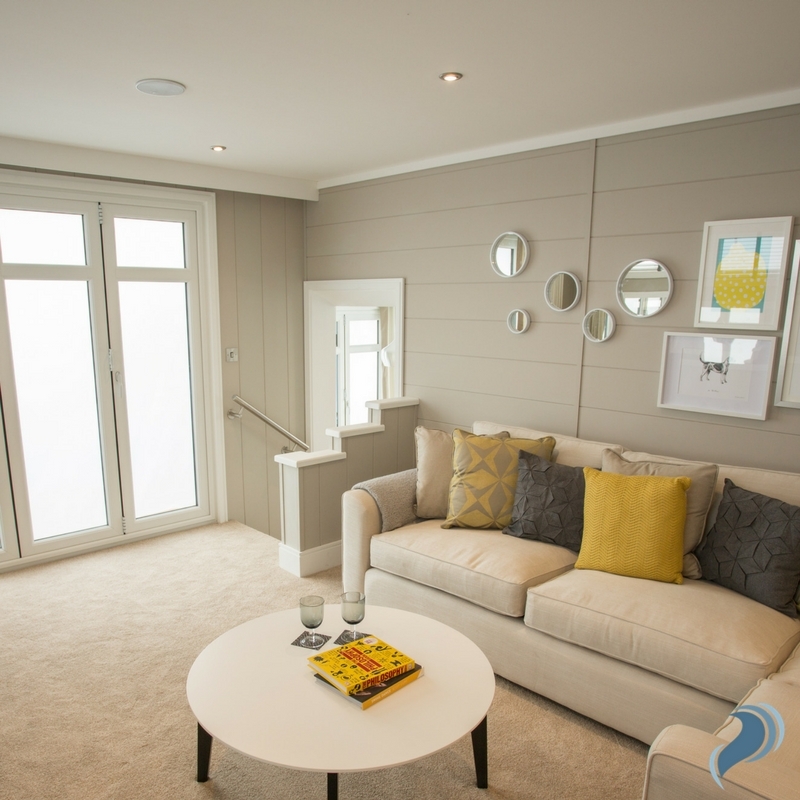 Whatever you enjoy doing in your living room at home can be recreated in the Lookout holiday lodge, only tenfold. 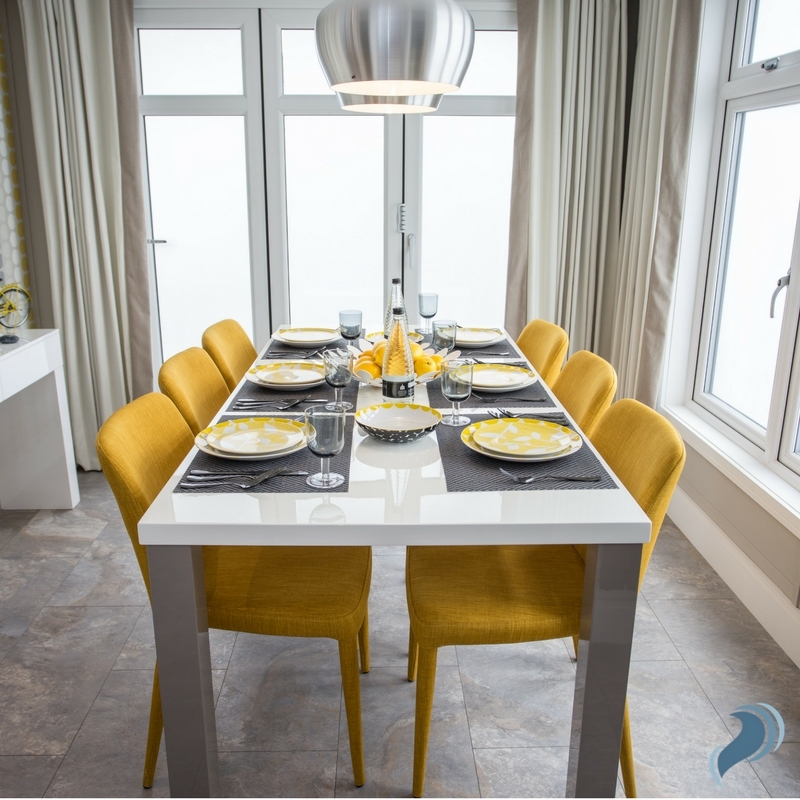 Often thought of as the soul of the property, the kitchen and dining space in the Lookout is distinctive with an edge of luxury. Decorated with the same relaxing creams and mustards, and deep, thoughtful greys throughout the rest of the property, the modern, on-trend kitchen provides plenty of side space, storage and kitchen mod cons. Keep the family closer than ever before as the lines between cooking and dining blur into one, offering a wholesome family eating experience. The dining area in the Lookout is framed by stunning wall-length windows, bringing an alfresco feel to breakfast, lunch and dinner all year round. 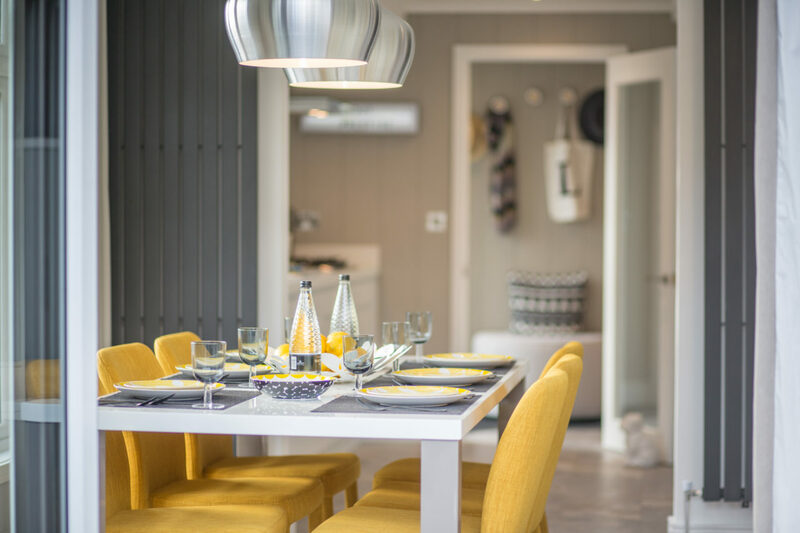 The glorious, mustard and white dining set is a dream to dress with elegant tableware, and it’s the perfect place for those you love to catch up in a way that is sometimes lost in hectic everyday life. After a busy day exploring, relaxing and having fun, there’s no better feeling than sliding into your pyjamas and spending the night in a Lookout bedroom. 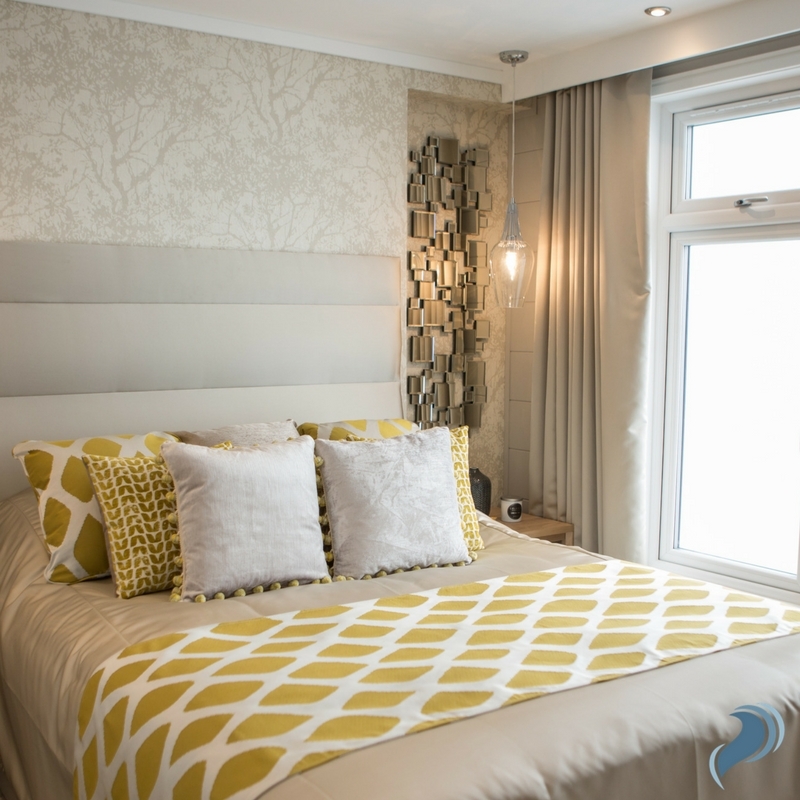 The master is complete with a stylish, spacious bed and is decorated with a myriad of retro yet elegant features, and the large windows, yet again, bring in the beautiful surroundings found at our award-winning holiday park. 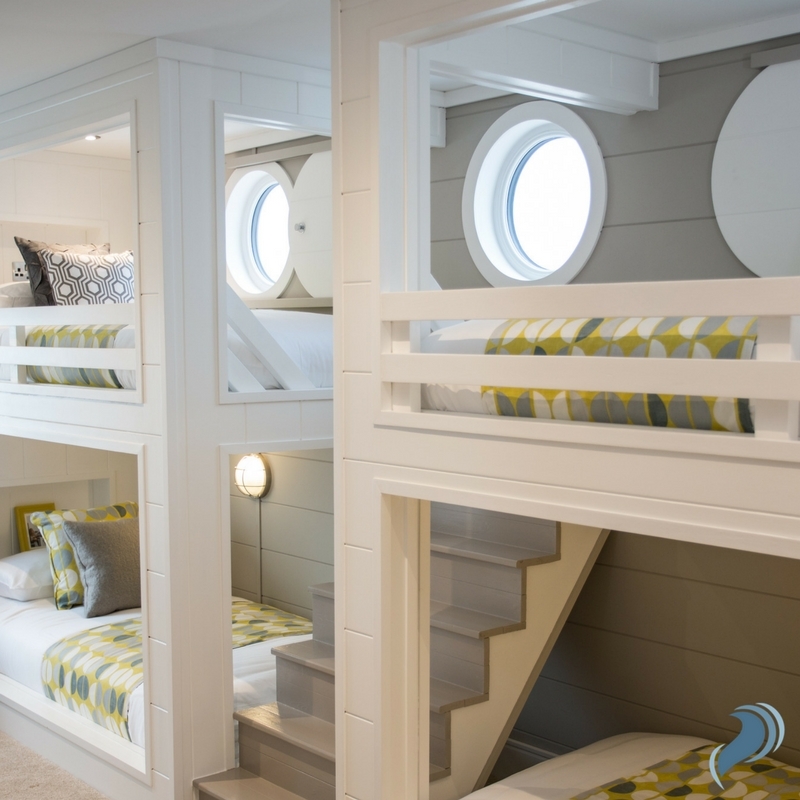 The mirrored wall decor and the eye-catching glass lights add an element of chic to the property, and there is a total of three, stunning bedrooms to choose from – one of which is complete with four funky, built-in bunk beds that little ones will adore. 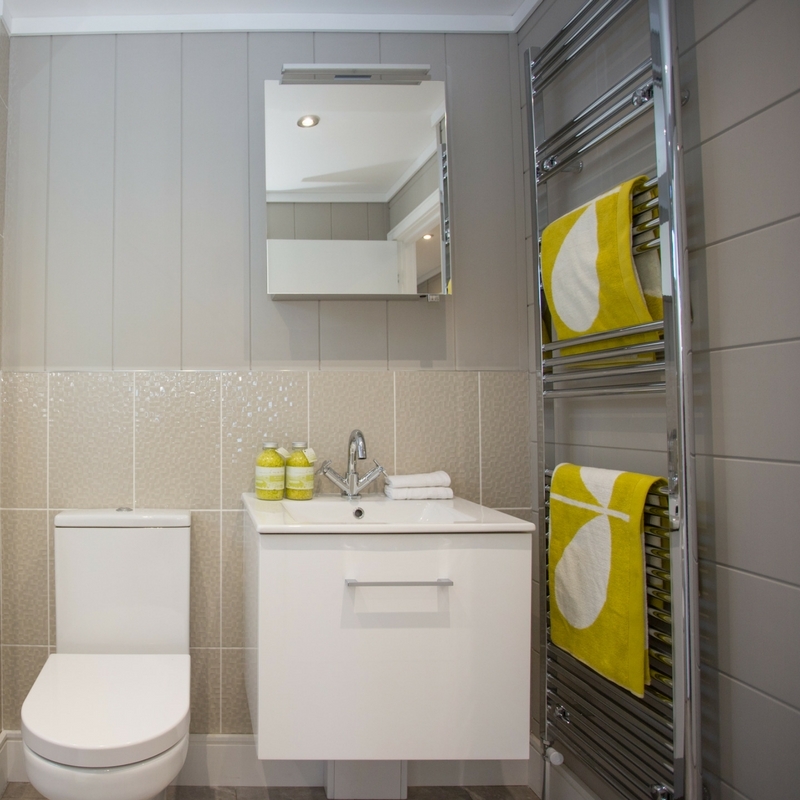 The second bathroom is an ensuite to the master bedroom, and comes with porcelain sink, toilet and a shower cubicle, meaning there’s plenty of space for everyone to get ready in peace in the morning. 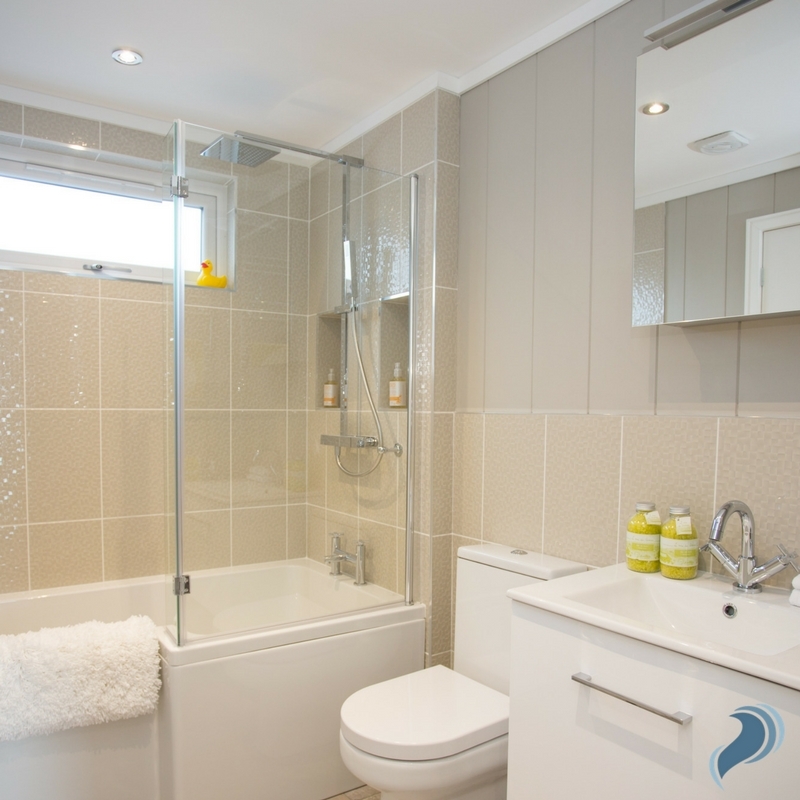 Each bathroom is home to calming white tones that sets the tranquil ambience, so much so that you’ll be hard pressed not to appreciate the summit of luxury this holiday home radiates. 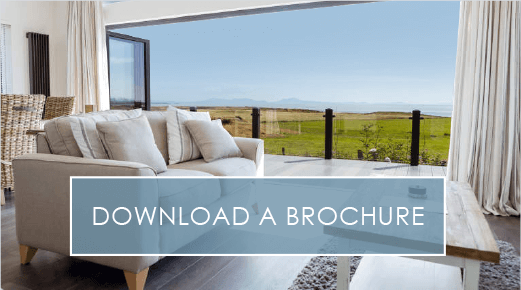 If you’d like to find out more about our bespoke Lookout properties, please don’t hesitate to get in touch. You can click here to explore the lodge page, or you can download our eBrochure here. If you’d like to speak directly to someone about this property then call our friendly team on 01407 860 860 or email us at sales@silverbay.co.uk. 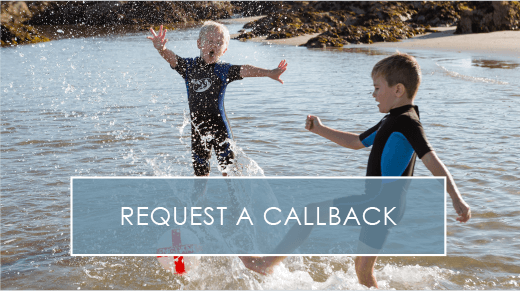 Become part of the Silver Bay family and spend your weekends and holidays de-stressing at our award-winning holiday park. nextFancy Visiting Silver Bay? 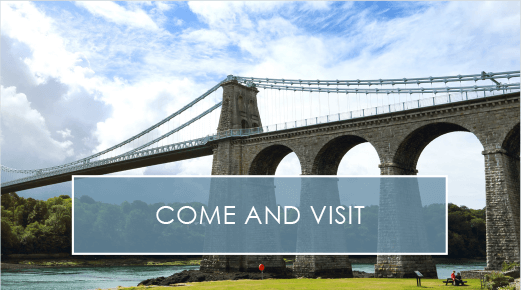 Come To Our Open Day On The 1st and 2nd of July!